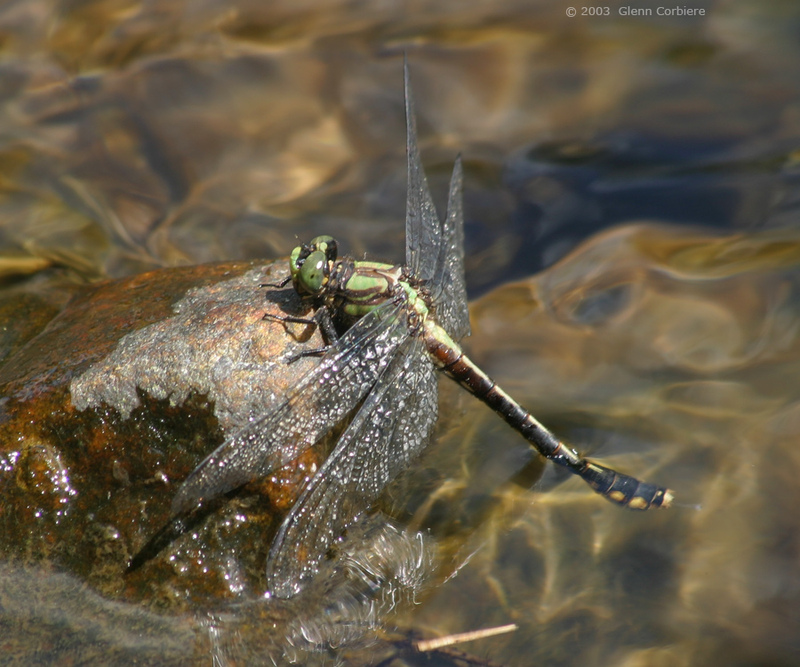 Ophiogomphus mainensis (Maine Snaketail), ovipositing female, Chester, Hampden Cuunty, Massachusetts, 7/20/2003. I remember watching this female Maine Snaketail plunge into the swift current, and then she was floating downsream, abdomen first. She then washed up over this rock; grabbed hold of it, and clung to it. I snapped a few photos. She flew away after a few minutes. When I looked at the images on the computer, I could see that she was ovipositing, and could actuall see the eggs being released. If you look closely you will see an egg trailing behind the tip of her abdomen. Copyright 2003, Glenn Corbiere. Image not to be used without permission.